My first memory is of my father teaching me to sit in lotus– I have never known life without yoga. As a child, my guru trained me in ancient Indian postures and philosophy, encouraging me to begin teaching when I was 16. I have been teaching ever since, exploring and integrating realms of knowledge. 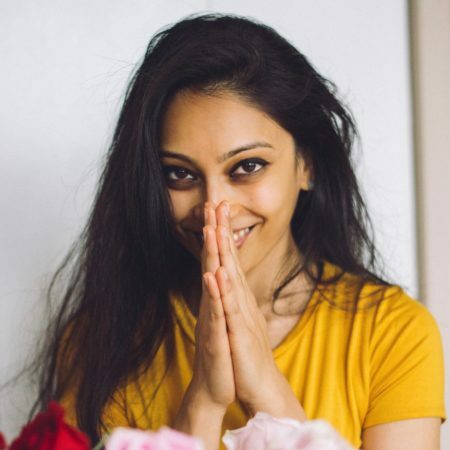 As an undergraduate at Duke University, I began practicing Ashtanga yoga, and later, after studying neuroscience at Georgetown University, I began independent study of the ancient yogic texts, the foundations of Buddhism, as well as Ayurveda and Iyengar yoga. Today, with 14 years of teaching experience, I feel incredibly blessed to teach full-time and integrate my studies of body and mind, modern and ancient. I spend mornings on my mat practicing Ashtanga yoga, and evenings practicing Iyengar yoga. In between, I write, play guitar, explore the city’s parks and museums, and live my dream: integrating science and art as a yoga teacher. Each of my classes is founded on tradition but infused with joy and creativity. Please join me! I would love to move with you.